I'm working hard at my 'real' job lately because we want the extra money for holiday! So I'm offering to do overtime, this means not so much time for making lovelies :o( However I'll try and make time where I can to add to the stores. For now here is one of the latest additions to Etsy and Folksy. I have seen lot's of beautiful hand wrapped jewellery by various jewellery designers and it inspired me to have a go my self at a spot of wire wrapping. 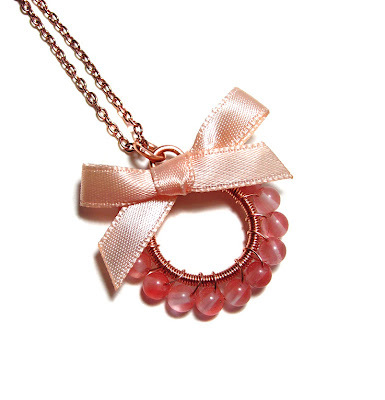 This particular item of jewellery featured beautiful rose quartz that i wire wrapped with copper to make the focal piece, before finishing them off with a lovely cream/pink satin bow and delicately hung on a vintage looking chain.